Tony Drago is desperate to prolong his career among snooker's elite and celebrate 30 years as a professional by righting some of the wrongs of the past couple of years. As things stand the Malta-born adopted Londoner will earn another two seasons on the main tour. But while the 48-year-old crowd favourite is still in prime position to keep his tour card, he is relying on other results to be certain. Should Kyren Wilson win two matches in the main draw at the World Championship, then Drago - who lost 10-3 to Peter Ebdon's conqueror Robin Hull in the first qualifying round - will miss out next season. "This is a bit of a wake-up call," Drago told BBC Sport. "If I stay on I will dedicate myself to the game. If I get my tour card again I will be 50 at the end of it and that will be 30 years in the game. Not many players have that. "I would love to give it 120% because the last few years I have only given 40% and that is not good enough." Longevity and dedication are not the first two words you would associate with Drago, a man famed for his gung-ho, quick-fire approach. His all-out attacking style have won him many plaudits since turning professional in 1985. But it has not been conducive to winning titles. Drago would not want to change his mentality, but admits it may have prevented him from achieving far more than two minor titles and a best showing of a quarter-final spot at the World Championship. "When I play - win, lose or draw - as long as the crowd have a smile then I am happy for them," Drago explained. "I always class myself more of an entertainer than a competitor. "I don't know how to play any other way. I just play like that and it happens. I don't try to play like that." But as much as he still loves the game, he will not be putting himself forward for qualifying school to win his tour place back should the worst happen. "Hopefully I will stay on but if I don't stay on I will not be going to Q School," Drago said. "I would not put myself through it because it would be too much torture, and I would be going in with the wrong mentality. There is no point in doing that. "But I will still be playing no matter what. I just love the game. I will be playing snooker for the rest of my days. "It doesn't have to be at the top level because you cannot play at the top level forever. I could be playing amateur, or local - or back home in Malta. 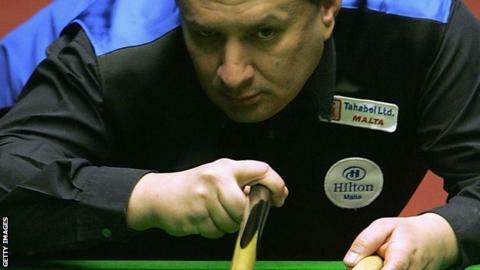 I can't see myself not playing snooker." The problem in the past few seasons has been putting in the hours away from the events. "I don't enjoy the I practise as much as I used to because I have been doing it all my life and it's the wear and tear," said Balham-based Drago. "When you get older the mental side gets harder. It's harder under pressure. "I am still good enough to compete but I don't enjoy the things that lead to competing as much as as I used to. "In the last few years I have not been a pro in practise and I hate flying so have pulled out of tournaments too." The attacking instincts will remain whatever level he plays at, but Drago knows the attitude has to change to maintain a thrill-a-minute career competing with the game's superstars.